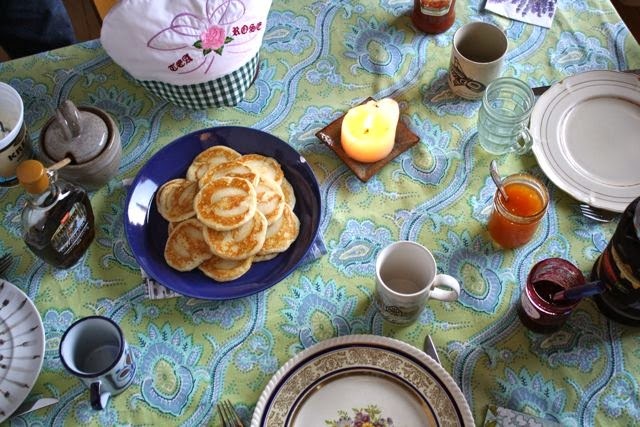 If you come visit us over a weekend, we will probably make you buttermilk pancakes for breakfast. Or maybe buttermilk waffles. They're both from the same master recipe and equally good but completely different. If I'm feeling fancy, I will find some fruit and carefully cut it into paper-thin slices. When the pancakes are crisping and bubbling on the griddle, I'll lay that paper-thin slice of fruit right onto the pancake. It gets a little caramelized when the pancake is flipped and the whole shebang ends up feeling and tasting like a proper weekend breakfast. The pancake recipe comes from The Breakfast Book by Marion Cunningham and the idea for adding sliced fruit (like peaches! and nectarines!) comes from Smitten Kitchen. 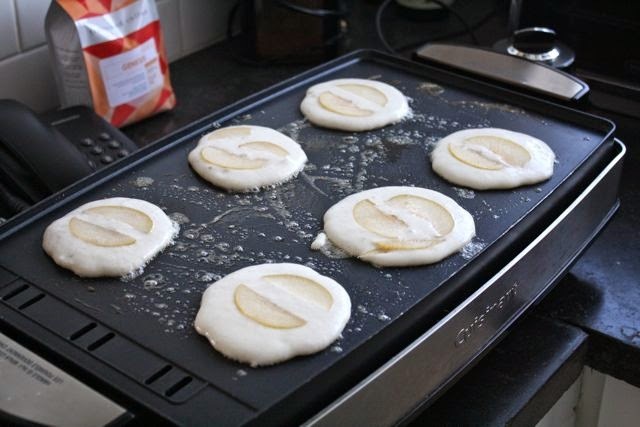 Buttermilk pancakes with apple-pear tops for the weekend. Only three more days . 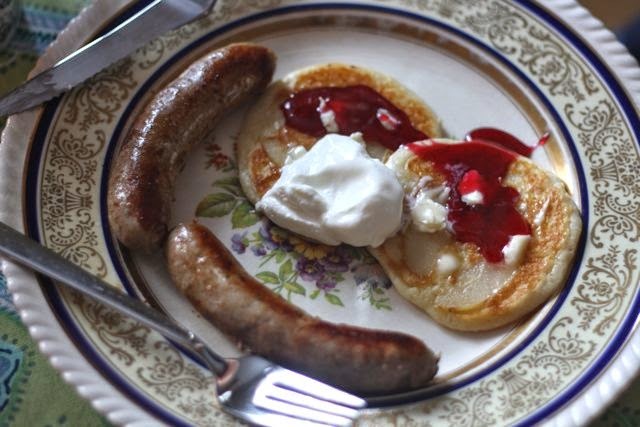 . .
dollop of yogurt and saskatoon-currant preserves. Heat your griddle to medium-high. Beat the egg yolks. Whisk them into the buttermilk and plain yogurt. Set aside. Mix the flour(s), sugar, salt and baking soda together well. Add to the yolk mixture and mix well. Stir the melted butter in. Set aside. Beat the egg whites until stiff but still moist. Fold them into the batter. Lightly grease your griddle with butter. 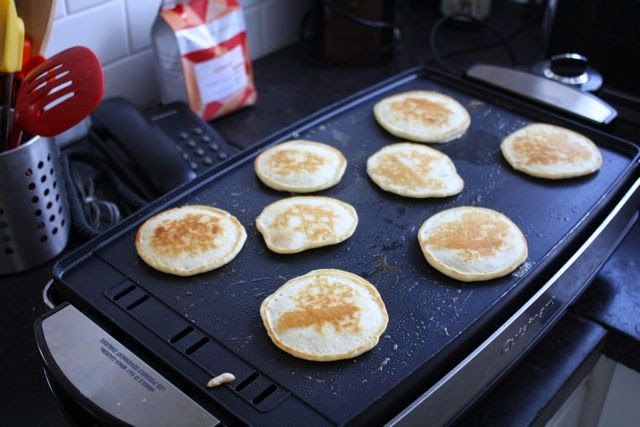 Dollop batter onto the griddle to make pancakes that are about 3 inches in diameter. Carefully place thinly-sliced fruit right on the batter. Look for little bubbles to show the pancakes have set and flip them over for another minute or so. Keep warm in the oven until ready to serve. I know! It was a wedding present and I think it's tied with my deluxe iron as the present I still use most often.